Perforated in 1 column by 1 row, this legal-sized, perforated paper has a 4" margin on the bottom and is available in several different paper weights. Use it to print church bulletins, work orders, invoices, payment receipts, and more using your inkjet or laser printer. 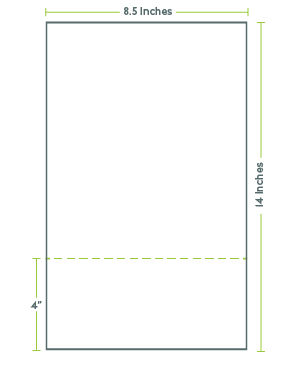 8.5" x 14" paper micro-perforated in 1 col x 1 row. Piece dimensions are 8.5" x 14" on top, 8.5" x 4" on bottom. Choose cream or white paper in several different stocks and weights. Helpful customer service and speedy delivery. All PerforatedPaper.com card stocks are pre-perforated in house…fast!